Protecting the rights and interests of our clients since 1978. Guided by the principle of fairness and the determination to ensure a just result. The crucial differentiator between Cohen, Sabsay and many other law firms is the more than 50 years of combined experience that its partners have in civil and criminal litigation at both the trial and appellate levels. 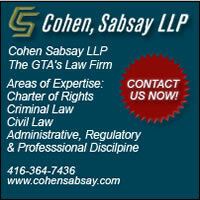 Please contact Cohen Sabsay LLP at Not Available to learn more about areas of services offered!